Nose: Caramel, grassy, eucalyptus, peppermint, bit of spice. Classic Heaven Hill profile. On the palate: caramel, burn, then spearmint, then peppermint, then more burn. Finish: long and assertive, tingles all over the mouth for a real long time. A slight hint of oak and char. Parting Words: . It’s ironic that in Michigan one of the best expressions of Heaven Hill’s style of bourbon comes in a brand they don’t own. The Ezra Brooks brand has a long history. It was made at the now closed but now refurbished Medley distillery in Owensboro, Kentucky for many years, and some of those old bottles and decanters are floating around. The current product is in the hands of Luxco, a company that buys its whiskey from other distilleries, as far as I can tell Heaven Hill almost exclusively, and bottles it under their own brand names. Currently Luxco’s bourbons are the Yellowstone, Ezra Brooks, and Rebel Yell lines. The EB line includes Ezra Brooks (90 proof), Old Ezra 101, and Ezra B. single barrel, originally a 15 y/o, but now a 12 y/o. 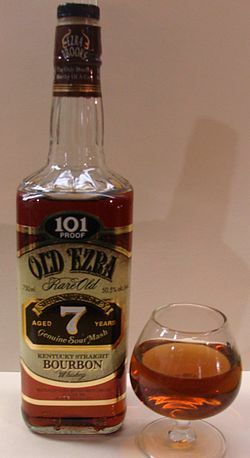 At any rate, in spite of being labeled a “sippin’ whiskey”, Old Ezra works just as well in mixed drinks. The high proof and moderate age make it a good match for more assertive mixers like cola, sours and ginger ale. This is one of my favorite bourbons in its price range. It’s good for just about anything. I always try to have some around.